Today we celebrate the feast of the Assumption of Mary into heaven. As I continued to pray, last week’s reflection about ‘dreaming small’ kept coming to mind. I couldn’t help but think of Mary’s role in being part of what we now call the Catholic Church. No matter what, she always seemed to be in the background observing what needed to be done and getting it done. We only have to think of the Wedding at Cana when she let Jesus know that the wedding couple was out of wine. Nothing big, but she observed the need and did something to take care of the need. And, we know the rest of the story. Mother Teresa was another such quiet soul, and I just love her quote that says: “Not all of us can do great things but we can do small things with GREAT LOVE.” All that she did and all that she taught her sisters was done with great love. It reminds me of the times I would travel to Haiti and people would say, “What difference do you really make going down there?” I would then tell them the story of a young child that had a terrible cough. I didn’t need a medical degree to figure out that her chest was all congested. I could feel her body as I was holding it. When I gave a bottle of medicine to the mother, the political scene in Haiti didn’t change but for that mother and child, their lives were about to change. One person, one situation, one life at a time. This is what matters. Where, when and how do I get a chance to do the small things with great love? There are so many opportunities during the day. What is key is being aware of them and doing them with a loving spirit. We need to be other focused, looking beyond our own wants and comfort. This is often easier said than done. Even one act of kindness can bring joy to someone’s day. It may even mean not doing something which could hurt another. The proof is in the pudding, as they say. How many smiles have you brought to others today? May your week be filled with small deeds of Great Love! Sr. Theresita serves on Board of Directors for Forward in Health, an organization that brings healthcare to the people of Fonfred, Haiti. 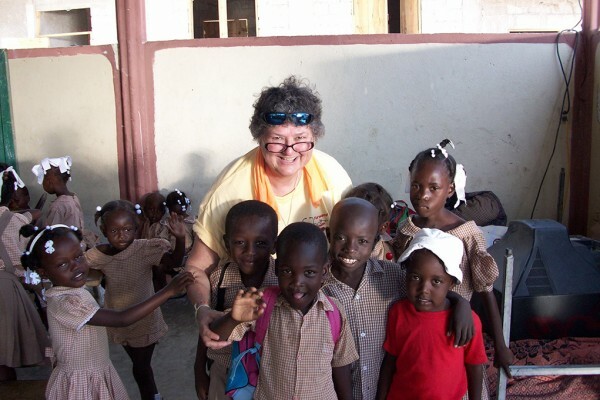 Photo: Sr. Theresita helping at the Klinik Fonfred in Haiti.